On the heels of the Ariad v. Eli Lilly en banc case which dealt with the issue of “written description” under 35 USC §112, the Federal Circuit has now issued several decisions dealing with “indefiniteness” under 35 USC §112. One of those cases is Enzo v. Applera, 2009-1381 (Fed. Cir. Mar. 26, 2010). In the oral argument of Enzo, Judge Plager expressed some frustration with the Federal Circuit’s current law on the issue of indefiniteness: [Listen]. How would Shakespeare construe the claim? In the oral argument in WNS Holdings, LLC, v. United Parcel Service, Inc., 2009-1498 (Fed. Cir. 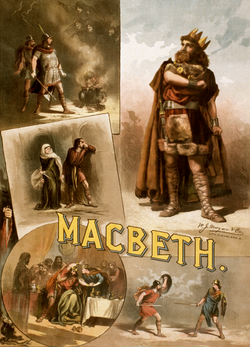 March 8, 2010), the attorney for UPS used an analogy to Shakespeare’s “The Tragedy of Macbeth” for purposes of arguing his claim construction case: [Listen]. Perhaps Shakespearean analogies are the key to winning at the Federal Circuit. UPS prevailed on the appeal. Judge Rader has been sitting by designation on several cases in the Eastern District of Texas. The 271 Blog noted that Judge Rader’s written opinion in one of those cases, PA Advisors LLC v. Google, Inc. et al., Case No. 2:07-cv-480 (E.D. Tex., March 11, 2010, order), has now been published. (i) retrieving, by one of the local computer system and the remote computer system from the remote data storage system, said selected data item for display to the user, such that the user is presented with a data item having linguistic characteristics that substantially correspond to linguistic characteristics of the linguistic data generated by the user, whereby the linguistic characteristics of the data item correspond to the user’s social, cultural, educational, economic background as well as to the user’s psychological profile. You can read Judge Rader’s written opinion for the district court here: [Link]. May an examiner search under any tree and under any rock? The recent case of In re Thorpe, 2010-1021 (Fed. Cir. March 8, 2010) concerned the issue of whether the cited references in a 103 rejection were non-analogous art. Judge Gajarsa took the opportunity at oral argument to ask the associate solicitor arguing on behalf of the PTO how broad an examiner’s search field may be. May the examiner search under any tree and under any rock or are there limits? Judge Gajarsa also asked whether the search field is limited to the art that one of ordinary skill in the art would deem appropriate to search. The PTO agreed that the art that one of ordinary skill in the art would look to would limit the field of search in an obviousness determination. [Listen]. The jury implicitly found that all asserted claims of the ‘838 patent were rendered obvious by known giant magnetoresistive (“GMR”) sensors combined with a coupling layer and magnetic layer from known artificial antiferromagnets (“AAF”). Siemens asserts that there was no motivation to make this combination. However, Seagate’s expert, Dr. Wang, testified that AAF structures with a coupling layer and a magnetic layer were known to those of ordinary skill in the art in 1992 and were also found in prior art patents and publications. Dr. Wang further explained in detail that based on this common knowledge of AAFs and known problems with prior art GMR sensors (such as stray magnetic flux) and the design incentives for solving such problems, a person of ordinary skill in the art would have been motivated to solve these problems using an AAF. In light of Dr. Wang’s testimony, a reasonable jury could have found that it would have been obvious to one of ordinary skill in the art to combine known GMR sensors with the coupling and magnetic layers from known AAFs to make the claimed invention. Common Knowledge. Refers to what court may declare applicable to action without necessity of proof. It is knowledge that every intelligent person has, and includes matter of learning, experience, history and facts of which judicial notice may be taken. Shelley v. Chilton’s Adm’r, 236 Ky. 221, 32 S.W.2d 974, 977. See also Judicial notice. Common Sense. Sound practical judgment; that degree of intelligence and reason, as exercised upon the relations of persons and things and the ordinary affairs of life, which is possessed by the generality of mankind, and which would suffice to direct the conduct and actions of the individual in a manner to agree with the behavior of ordinary persons. Mark your calendar and save the date of June 24th, 2010. The AIPLA has calendared that date for the AIPLA Electronics and Computer Law Road Show in Denver, CO [Link]. I believe this seminar formerly went by the name AIPLA Advanced Electronics and Computer Law Seminar. Kudos to the AIPLA for reinstituting this valuable seminar that has been on hiatus for the last few years. By the way, late June typically has ideal weather for visiting Denver and hiking and biking in the Colorado mountains. The White House has nominated Judge Kathleen O’Malley from the Northern District of Ohio to fill the vacancy on the United States Court of Appeals for the Federal Circuit. Judge Kathleen O’Malley from the Northern District of Ohio is rumored to be the nominee for the open position on the Federal Circuit. Judge O’Malley sat by designation at the Federal Circuit in 2007. You can listen to Judge O’Malley in this oral argument from Ormco Corp. v. Align Tech., Inc. [Listen]. You are currently browsing the 717 Madison Place blog archives for March, 2010.